I was just about haggised out after putting together last week’s round up of Robert Burns activities and dinners. Then Chef Martin Kouprie of Pangaea (1221 Bay Street) sent me a message on Twitter. He was holding a haggis competition for his kitchen staff; the winning dish would be served in the restaurant on Robert Burns Day. Would I like to come and be a judge? I was of two minds; my experience with offal – all organs and all animals (I’ve only recently learned to like foie gras) – hasn’t been good. But then I remembered the advice of Vogue food writer Jeffrey Steingarten, that you must try a food at least ten times before you can determine that you truly don’t like it. I’d had haggis once before and found it repulsive, but here was an opportunity to try seven additional versions of the dish, created by seven different professional cooks who would be pulling out all the stops to make the lowly stuffed sheep’s stomach into gourmet fare. On the big day, we gathered together at a large table at the back of Pangaea. Besides myself and Chef Kouprie, the judges included handsome devil and Toronto Star food writer Corey Mintz, chef and cookbook author Lucy Waverman, and Alison Fryer of The Cookbook Store. Waverman and Fryer, both of Scottish descent, had one over on the rest of us as they were both connoisseurs of haggis, having eaten it growing up. They had a better scope of what makes a good versus a bad haggis (balance of spices; ratio of offal – generally heart, lungs and liver, aka the “pluck”; consistency; and texture of the casing) and both based their assessment on the haggis themselves (note, the plural of haggis is, in fact, haggis, although we were unsure at the time and considered both “haggises” and “haggi”), whereas the rest of us looked more to the whole dish. Of the seven dishes presented, only one was served in an actual sheep’s stomach. Which was fine by all of us, since the sheep’s stomach was much thicker than the intestines and artificial casings used in the other dishes and added its own distinct flavour to an already strong filling. Besides the pluck, haggis are typically stuffed with pinhead oatmeal or pearl barley, onions, suet, spices and salt, with the whole thing being left to simmer for a few hours until the filling is cooked. I know, it just gets more and more appetizing. The haggis ranged from mild in flavour to very strong and offally. One version, presented as a meat pie in a parmesan pastry crust and topped with beet relish, was the least authentic haggis-wise, but was the most palatable to me because it was also the one that tasted the least of the pluck. Another version that I could live with, and potentially enjoy, was a deep-fried version in which balls of the haggis filling were dipped in batter and fried. There was much discussion at the judging table, particularly by Waverman and Fryer, as to the complete inauthenticity of this version, but a Google search after the fact reveals that it’s a regular offering in Scottish fish and chip shops, served up either as a burger patty or in balls with tomato relish. Accompaniments were where the competitors really shone, and where the winning dish edged out the others. Many versions of neeps and tatties (turnips or rutabagas and potatoes, generally mashed) appeared before us, some liberally flavoured with horseradish, others topped with fried leeks and slices of candied parsnip. One entry offered amazingly light crepe-like potato pancakes, while the deep fried haggis came with crisp spicy fries. 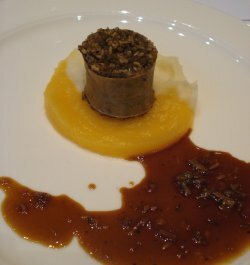 The winning dish, however, as created by saucier Christopher Waye, took haggis into gourmet territory. Waye’s dish offered two small rounds of a mild sausage-shaped haggis, served atop diced turnips, chanterelle mushrooms, caramelized Brussels sprouts and garnished with a poached egg. Waye’s reasoning for the egg was that it essentially created its own sauce, giving the diner something to dip the haggis into. As the haggis-hater of the group, I definitely appreciated this consideration – anything available on the plate to eat with the haggis and thus mask some of what I came to refer to as the “stank of death” from the offal was A-OK by me. Fryer and Waverman took umbrage with the inclusion of the chanterelles, citing them as unnecessary and that they unbalanced the dish. This is true to some extent, but hey, it’s chanterelles. I’ll take yours if you don’t want ‘em. Waye’s haggis dish will be offered on Pangaea’s lunch menu on Robert Burns Day, Monday, January 25th. For his efforts, the saucier was presented with a bottle of The Macallan 17 Year Old whisky which he undoubtedly was expected to share with his co-workers in the back of house. And while I didn’t learn to love that “Great Chieftain o’ the Pudding Race”, I came quite a bit closer to my “ten tries” and knowing that I probably don’t like haggis all that much. Waye most definitely made it palatable (although I will admit to eating only one slice of the haggis and concentrating on the other delights on the plate), and I’d recommend that anyone who is haggis-curious should go check out his dish because it’s certainly a more elegant and accessible dish that the traditional serving suggestion. Congratulations to Christopher Waye and many thanks to Chef Kouprie and everyone at Pangaea for a great afternoon and a truly memorable experience. Please keep me in mind if you ever do another staff competition for something that I actually like, such as, oh, lobster or truffles or sea urchin roe.